One of the more entertaining musical shows on the Strip is VEGAS! 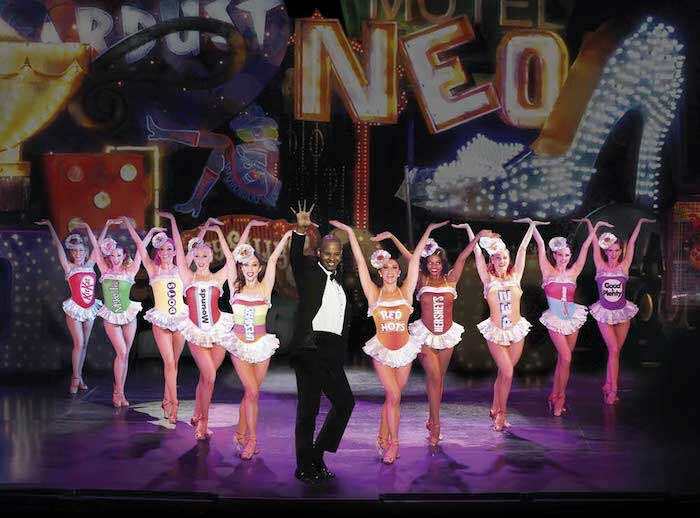 The Show, that intertwines a wonderful monologue with many of the iconic musical hits that made Las Vegas the entertainment capital of the world. VEGAS! 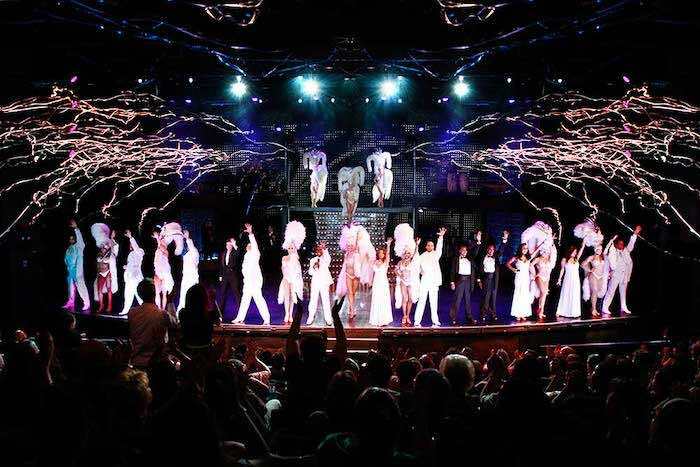 The Show is showcased at the incredible Saxe Theater that is located within the Miracle Mile at the Planet Hollywood Hotel and Casino. This intimate theater is home to the acclaimed producer and writer David Saxe who has brought this incredible musical that walks you down the historic memories of Las Vegas entertainment. Guests should not go expecting to witness a tribute or impressionist show. Patrons will gaze in amazement how the 40 plus performers gracefully flow across the stage while performing signature hits from iconic Las Vegas artists like the Rat Pack or Tony Bennett or Elvis. The orchestra features quality musicians that never miss a beat during this 75-minute presentation. VEGAS! 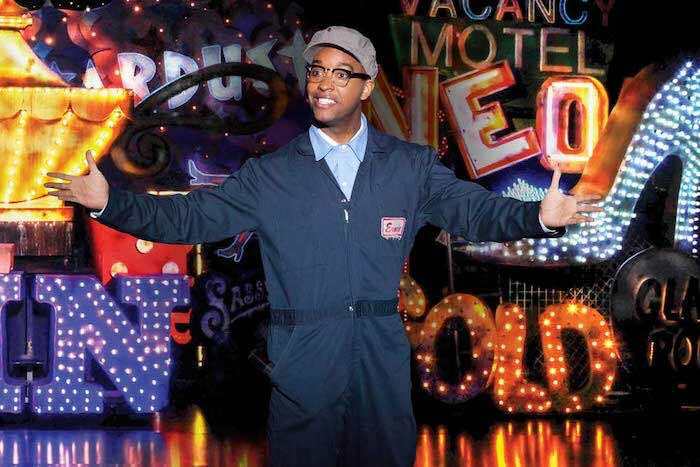 The Show opens when Ernie, the custodian of the fabulous Las Vegas Neon Museum, begins to walk through the glorious neon signs of the past from such grand Vegas properties as the Glass Pool Inn, the Sands and the Silver Slipper. Ernie urges the audience to travel back in time with him to a Las Vegas that made the Strip the entertainment capital of the world. The performers are highly skilled at their art of dancing or singing and guests will enjoy the non-stop stage choreography that is presented by Tiger Martina. Show girls of the past accompany many of the singers on stage to enhance the visual effects of this show. The show suggests that gambling might be the back bone of Las Vegas but entertainment has always been on the cutting edge of new musical styles. This is portrayed in the show by a lovely single female dancer that blows kisses of luck on the several male dancers during a rousing Luck Be a Lady. VEGAS! 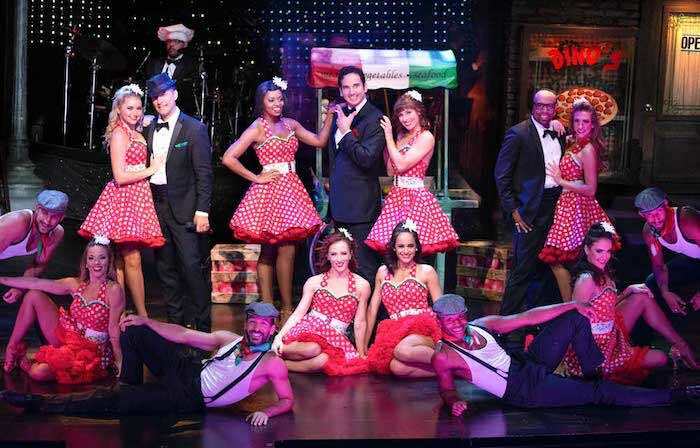 The Show, also highlights such acclaimed Strip acts as Sammy David Jr. singing the Candy Man that is complete with dancers dressed in candy wrappers to an Elton John medley that leaves the Rocket Man traveling in space to Sonny and Cher singing I Got You Babe. After the performance, patrons will never forget the storied headline artists that graced the stages of Las Vegas over the years. VEGAS! The Show is ideal for anyone looking for an entertaining walk down memory lane. The 40 plus member cast of VEGAS! The Show is quite talented and begins with producer/writer David Saxe. David was born and raised with Las Vegas entertainment in his blood. His mother was a dancer and his father performed with the original Rat Pack. 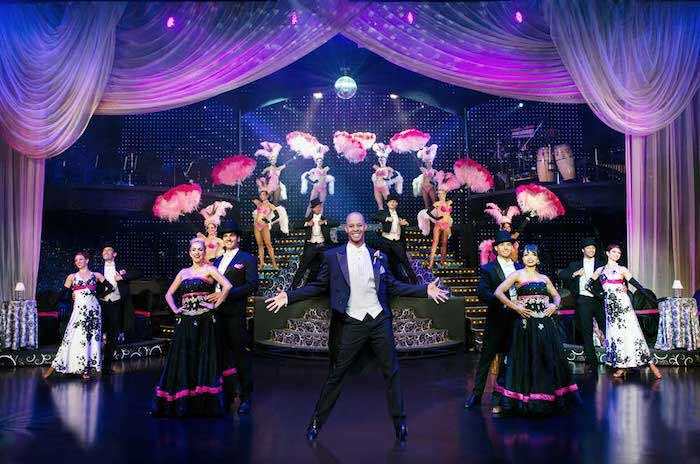 David has produced such blockbuster shows such as V-the Ultimate Variety Show and the Showgirls of Magic. At the age of 17, David produced his first Las Vegas show making him the youngest producer of a show in Las Vegas history. Tiger Martina is the choreographer and director of VEGAS! The Show. Tiger is well known throughout the industry for his innovative approach to choreography. Tiger has worked with such artists as Michael Darrin, Paula Abdul and Liza Minnelli as well as choreographing large scale events like the Macy’s Thanksgiving Day Parade. Pat Caddick is the musical director who brings all of the historic sounds of Las Vegas to the stage. Pat has been involved in the music scene for over 25 years and has worked with such artists as The Pointer Sisters, Celine Dion, Wayne Newton and Tower of Power. Over the years Pat has worked as a musician, arranger, director, orchestrator and producer as well as being a faculty member at the University of Southern California. The band leader is Jerry Lopez who originally resides from Santa Fe, New Mexico. Jerry perfected his skills as a studio guitar artist at a young age and has played with such acclaimed artists as Kenny Loggins, Carlos Santana and Clint Holmes. Jerry guides his band, the Santa Fe and the Fat City Horns, through a variety of stunning renditions of the iconic Las Vegas songs we all endear to our hearts. Reva Rice is a talented performer who graduated from the Boston Conservatory of Music. Reva has starred on Broadway as well as the world while working with such artists as Patrick Swayze, Dolly Parton, Chaka Khan and Sir Andrew Lloyd Webber. Tezz Yancy is a multi-talented musician with training from the Berklee College of Music and the Boston Conservatory. Tezz has performed in many venues around the world including Broadway and Las Vegas. Tezz also was involved with such shows as Five Guys Named Moe and the Starlight Express. Darren Lorenzo is a fascinating artist who was trained on prestigious projects like the Broadway Theater Project at South Florida University and Theater Emory at Emory University. Darren has performed on and off of Broadway in a variety of musicals from Madagascar to Saturday Night Fever to Once on This Island. Josh Strickland is a talented singer who hails from the College of Charleston. Josh has been seen on such shows as the Today Show, The View and American Idol. Josh also performed the leading role on Broadway as Tarzan in Walt Disney’s Tarzan: The Musical. VEGAS! The Show is being performed at the Saxe Theater located within the Miracle Mile at the Planet Hollywood property. The Saxe Theater is quite intimate with seating limited to fewer than 400 patrons. The 22,000 square feet stage is supported by an advanced multimedia platform that enhances the guest’s experience. There are no age restrictions for VEGAS! The Show. This fabulous musical is performed twice nightly at 7:00 and 9:00 P.M. each night of the week. Vegas! The Show Tickets are on sale with a choice of General Admission, Balcony, Dinner + ticket special with VIP seating.